Home Be Inspired What Would YOU Like To See More Of In A Vintage Nerd Blog? What Would YOU Like To See More Of In A Vintage Nerd Blog? As I take on my 365 Blogging Challenge for the year 2014, I must ask my readers...what would you like to see more of on A Vintage Nerd? What books did you find interesting or films? Anything you want to learn more of or get more information on? Do not hesitate to let me know! I write for my pleasure and enjoyment but the opinions of my readers are very important to me as well. If you don't feel comfortable posting on my blog, feel free to email at avintagenerd@gmail.com or message me on my Facebook blog page! 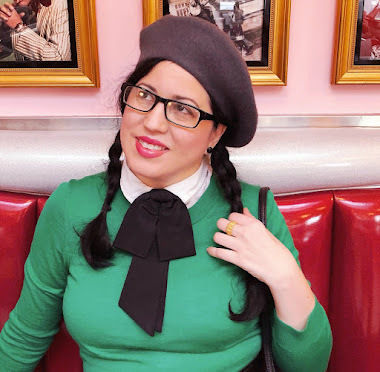 I love a good mix of post topics on the blogs I follow, but in general, I'm particularly fond of those pertaining to fashion and beauty, real world vintage photos, how-tos, and ones show us a glimpse into the life and/or inner thoughts and feelings of the wonderful person behind said blog. Hi, I'm Daffny! A Vintage Nerd is the place where I explore Old Hollywood through Vintage Inspired Fashion, Film, and Books. Oh Peter Pan Collars! How I Love Thee! Let's All Move To Pickfair! The Flambards Cast: Where Are They Now? Vintage Nerdy Goodies From Santa! Hello, thank you for visiting A Vintage Nerd!